Gallia Commissioners reorganized Thursday. David Smith will serve as the board’s president while Brent Saunders will serve as its vice-president. 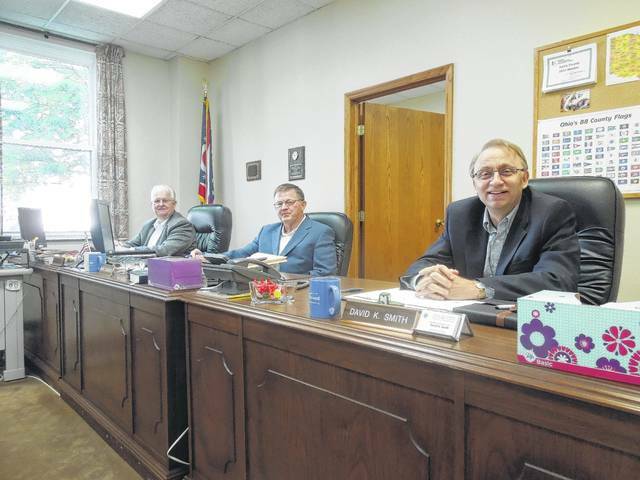 GALLIPOLIS — With the new year in full swing, the Gallia County Board of Commissioners gathered for their regular meeting Thursday in the Gallia Courthouse to select the board’s new president and vice-president and to discuss the county’s future challenges. David Smith will serve as the year’s president and Brent Saunders was selected to serve as the board’s vice-president. Smith said the commissioners would continue to keep the county running as efficiently as possible. At the state level, county government supporters are still looking for answers to replace funds lost with the state’s pulling of Medicaid-managed care organization sales tax (MCO). Gallia County will lose around $600,000 a year due to the state policy change. The will be receiving a one-time stipend of around $900,000 because of the loss, but local government supporters are looking for a more permanent replacement for the lost funding. “Officially in 2019, those funds will be gone,” said Commissioner Harold Montgomery. Montgomery anticipates the state has not finished in its decisions to potentially allocate more funding to counties based on a formula due to the MCO loss, but as to what the end result amount will be is still in question. Currently, the commissioners feel confident about their position going into 2018. With the end of the Green Township Sewer Project Phase One nearly complete, the commissioners are turning their heads to the future with the project’s phase two. County officials are in the process of shoring up funding and grants for the project but do not believe the project will be bid out to contractors until 2019.